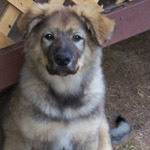 Lance is a Norwegian Elkhound/lab mix who was born on 3/20/07. Lance, Leroy, Lettie, and Lacey are all siblings from the same litter. They are a very sweet group of pups. Sweetie is the most adorable little puppy you'll ever meet. She is tiny in stature but big in personality. She loves to play and play and also loves to be held. She is too tiny for small children and too active for a senior, but would be wonderful for a family with teens or a work-from-home adult who truly has the time for this adorable pup. Update: Mr. Fluffy has undergone his Heartworm treatment and is doing very well. He should be able to go home mid to late June, but can be seen now. Mr. Fluffy is five year old neutered male Collie/Golden/Chow mix. To know him is to love him. He is in a foster home and has proven to be totally housetrained and safe in the house, although he does get a kick out of rearranging items in the house once in awhile. He has the most wonderful personality, is great with dogs, cats, people, and is extremely mellow (well no wonder). He is just about the most "bomb-proof" dog we've ever met. Het doesn't mind having dogs jump all over him or kids either. He is just the mellowist boy. Everyone who meets him adores him! He's mature dog so it wouldn't be fair to place him in a family with little children, but he would be fine with visiting grandchildren and is calm enough to be a dog for a senior citizen. In his foster home he is great with their female Corgi and he escaped from his crate, but didn't touch anything in the house. 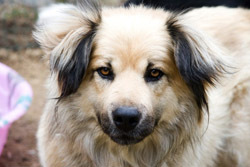 Teddy is a neutered five year old male Shepherd/Collie mix who was rescued in TX and brought to MA by a well meaning family, and he is loveable in many ways, but the family has two toddlers and he growled at them. He is friendly, gives kisses, was great at the vet's, and very low key. He will not dig up your yard. He just wants a friend with whom to hang out. He is very affectionate and lovable. He just shouldn't go with little ones. Teens should be fine and adults preferred. He is a gorgeous dog who only weighs 38 lbs, but needs to gain 10-15 lbs to be normal in size. You can feel his ribs and back bone under that soft fluffy fur. 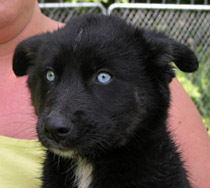 Thadeus is a 10-12 week old male husky/lab mix. He has longish hair with gorgeous blue eyes and beautiful markings. Available for meeting after 6/25 to approved applicants. He loves the water and is a friendly, playful pup. 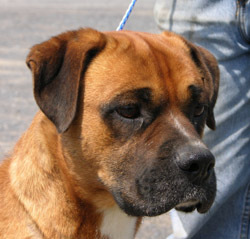 Atticus~Boxer 45 pounds 5-6 years old. fawn. neutered 6/11/07. He brought in as an abandonment case and was very thin and sad. This dog has had a rough life. His first foster family in WV says he is the most loyal dog they have ever had and theyhave fostered over 200 dogs. Atticus is a people dog and he simply wants to be loved. He will follow you around like a puppy. When you sit down, he curls up at your feet or puts his head in your lap. He is extremely loyal and devoted to his people. He is good with other dogs, but best with females. Lindy Lou is his best pal, but when there are people around, all bets are off --that's his first choice. He was to be put to sleep at the vet office for his time was up by the county to pay the holding days. Nothing was done to the owners. sad but true for this area (written in WV). He has one knee that is sore from an old injury but the vet said it can be managed without surgery. He's truly had a rough life. Atticus is here in MA now and needs a loving owner. We would prefer he be an only dog because he's never had a family to love him. Because he is a mature adult male, we are looking for an adult home. He is great with cats, lived with many of them and will ignore them. He's housebroken and will use the doggy door to go out. 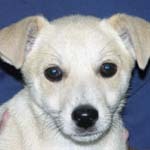 He will be at our Meet and Greet on Saturday, on June 30th at Especially for Pets in Wayland from 11-1. 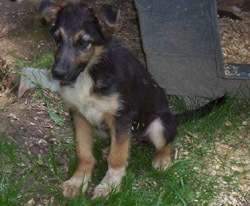 Matilda is an Australian Shepherd/Shepherd mix puppy who came from a mom who was an Australian Shepherd mixed with Shepherd. One of her siblings who got adopted was blue merle in color, but Maya is tricolored. She will be available after 6/25/07. No phone calls please. If you fill out an application, we will respond after she becomes available. 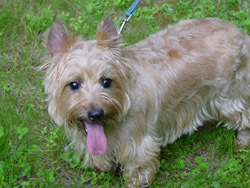 Zeppelin (Zeppy) is a two year old neutered male Cairn terrier who is looking for a new home. He is a purebred dog, bought from a pet store, and has a condition known as fly biting, where he snaps the air at imaginary bugs. It's not quite a seizure, but called idiopathic epilepsy. He was on Phenobarbital and potassium bromide, but we have it under control with homeopathy. We'd like an adopter who will keep him on a holistic protocol, so we're looking for a holistic-minded adopter. 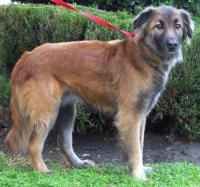 Zeppy is a smart, joyful, energetic dog who loves to play. He is a little character and extremely cute. He is well worth the effort that anyone can put into him. We're hoping for a stay-at-home or someone who only works a couple hours a day so that his condition can be closely monitored. He has a lot of energy and is extremely playful.